I’ll never forget what it felt like to listen to Jake speak his first sounds this time last year. My baby, who had spent a lifetime in silence, began to say his first consonant-vowel combinations with the help of hand prompts. It astounded me then and honestly, still does. When I first saw that public school SLP in action, I thought, How could moving your hands possibly help you speak? Then, I thought about how much I have to move my hands in order to get my words flowing when I communicate. If it wasn’t for my hands, I might not ever get any of those words out! When Jake uses a hand prompt, 9 out of 10 times he gets the sound right. His accuracy isn’t nearly as good if he doesn’t use the gesture. I’m not sure why it works for us – vestibular system stimulation or kinesthetic learning or some other word that SLPs are trained to understand – I just know that it absolutely gets the job done. A few months ago I discussed this concept with my neighbor, the Pre K-4 teacher, and also told her that I was going to begin working with Jake on phonics. Based on his past history with hand gestures and also because of the success that she had seen in her own classroom, she suggested that I try the Zoo-phonics system. Over the summer, she let me borrow her flash cards and Jake has loved every moment that he’s got to spend with these cute animals. Uses Animals in the shapes of lowercase letters before teaching the actual letters for easy remembering. Teaches the sounds of the letters through the animal names (“a” as in Allie Alligator, etc. 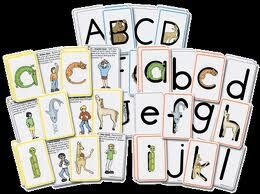 ), and letter sounds are taught before letter names. Teaches lowercase letters before capital letters. After all, reading materials are written 95% of the time in lowercase letters. The Zoo-phonics Body Signals allow children to put their natural “wiggles” to good use and act as a cue for memory. I’ve been waiting to blog on Zoo-phonics because I wanted to see if it really worked. Could Jake really learn the letter /a/ by seeing a picture of an alligator with a bow in her hair, opening and closing his arms like an alligator’s mouth, while simultaneously saying the sound? Yes, yes, yes!!! I am proud to report that after a couple of months of doing these flash cards, he now knows all the sounds of the alphabet. The best thing is that it was effortless and he had fun learning. Now, we are working on building words and introducing uppercase letters and the letter names. Out of all the sounds in this series, I think /t/ is the cutest … Timothy Tiger flexing his muscles. It was the one that Jake learned first and the name of this animal friend is also my hubby’s name. Love it! Hi, I just started following your blog and try to correlate it to my daughter who is 7 and has apraxia and autism. She uses the Kaufman cards with her therapists and her head SLP made the cards with Nancy Kaufman so I know we are working with the right people. I am still trying to teach the letters to my daughter so not ready for sounds yet but she has trouble with fine motor so signing has always been hard for her. How intricate or difficult are the actions for the letter sounds? It looks interesting and something I might want to pass on to her school. Thanks so much! Becky- Jake always had trouble with learning to sign; his fingers never wanted to cooperate. But, these movements are so big, you may not have a problem. For example, “z” is a zebra sleeping and you put your hands up to your face like you are sleeping while saying the sound or “e” where you’re swinging your arm like an elephant trunk. A couple are a little more intricate, but not anything like sign language. If I’m remembering correctly, I think I read somewhere that this program was initially used in special needs classrooms. Best of luck to you! Wow! I think I will order those for Olivia for her birthday. She loves animals. What a great idea! !